Good morning, Source readers. I’ve been out of town but am now ensconced back at Source World Headquarters in DTLA. When I moved to the L.A. area back in days of yore (1994), DTLA was mostly a ghost town. Now it has bike share, Disney Hall, dozens of new buildings and restored buildings, a major sports arena, trains going to SaMo, East L.A., Azusa and NoHo, ride sharing, etc etc etc. Things certainly change. Some brief travel advice: Jenny’s Giant Burgers and Eggheads in Fort Bragg, the Half Moon Bay Coffee Co. in Half Moon Bay and camping at MacKerricker State Park north of Fort Bragg, which allows easy access to sunrises over the Ten Mile Dunes. Good news: sunrises are still free in some state parks! Perhaps an exaggeration, but we’ll take it. Please make sure you have a good handhold before the dragon departs the station. I suppose there are issues, too, involving reliability as I fully expect some dragons may excuse themselves from service every so often. Just as I suppose few people would be willing to tell the dragon to get back in service. Or else. A look at the project that would extend the Gold Line from its terminus in Azusa to Montclair. The project is currently without a source of funding, although those dollars could be supplied by the sales tax ballot measure that the Metro Board has approved for the Nov. 8 ballot. To clarify: the ballot measure would fund the project to Claremont. Why? Metro is a Los Angeles County agency and Claremont is in L.A. County. In order for the project to reach Montclair, San Bernardino County would have to commit funds for any track/stations within its boundaries. Either way, I think the project would be a boon for S.B. County residents. Many bus lines feed into Montclair, where there is also room for plenty of parking. Bigger picture, a Gold Line extension would allow Metrolink riders coming from S.B. County to transfer to a train accessing the 210 corridor cities, including job-heavy Pasadena. Neal Broverman isn’t happy that most Metro Rail service moved to 20-minute frequencies between 8 p.m. and 9 p.m. beginning with the June 26 service changes. That’s an hour or two earlier than previous. Neal writes: Missing a train and waiting another 10 minutes is a bummer; 20 somehow feels like an eternity, especially if you’re tired, tipsy, and in a subway station with spotty cell service. New riders may say “Screw it,” and call an Uber. Or other may hear about the new frequencies (also called “headways”) and avoid the train altogether. Either way, it doesn’t feel like a great way to usher in new rail lines. Obviously the bulk of Metro ridership has historically been from the morning rush through the evening rush. We’ll see how this works out. Our ops staff says that the change mostly impacts the Blue, Expo and Gold Lines and that the 20-minute frequencies were mostly already in place due to night-time maintenance on the various rail lines. Or, as they put it, “the 20 minute night headway better reflects the headways we were actually able to run the majority of nights.” Many readers have also pointed out something first reported by Joe Linton on Streetblog: that cutting frequencies was discussed by the agency as part of a series of cost-cutting moves. Oh how I love articles that debunk the superiority of the Bay Area to our little village-by-the-sea. 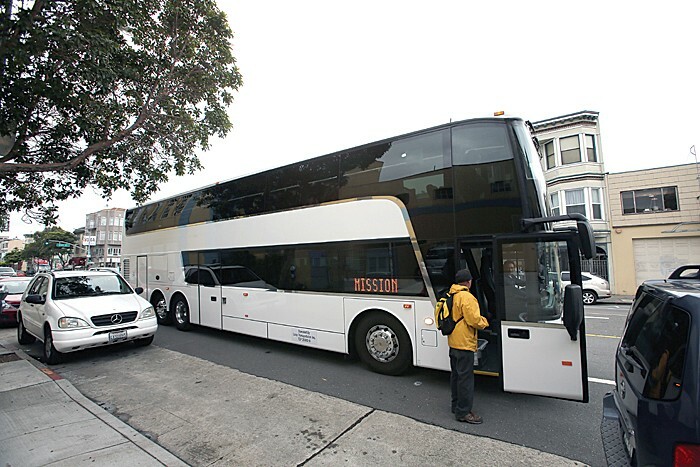 Long story short: Many employees for tech giants such as Facebook and Google live in the city of San Francisco but rely on company shuttle buses to travel 30 or more miles to their jobs that are located south of the city on the S.F. Peninsula. A Google Bus in San Francisco bound for Mountain View. Photo: San Francisco Examiner. Problem is, the private company shuttles have been using city bus stops. And smaller city streets. Residents have complained, so the number of places where the private buses — which are decidedly nicer than city buses — can stop has been reduced. The result: an uptick in the number of people driving. BTW, it’s not as if there are no public transit options here. The Caltrain runs between S.F. and San Jose but…that requires tech workers in S.F. to get to the Caltrain station and then get from Caltrain station to their work campuses. Bottom line: the tech world has yet to solve the problem of the long-distance commute. I’m not sure where my sympathies are located on this one, although I tend to feel like the benefits of private shuttles in terms of taking cars off the road outweigh their problems, including the smell of elitism. BTW 2: I was in the Bay Area over the weekend, including my first visit to Palo Alto — a place that feels as if money is growing on trees (many of the venture capital firms that support tech companies are located in the city, which also is home to Stanford U.). A friend of mine also works in a tech firm there and what a wonderful office it was: there was a slide between floors, free food (including cashews!) and even a music room where workers could play electric or acoustic guitars to blow off some work steam. BTW 3: Metro does not have a slide, free cashews (or any other nut) or a room where employees can shred a guitar between How We Roll items. South L.A. is certainly a hotbed of Metro service — including dozens of bus lines, two rail lines (Blue and Expo) and a future rail line (Crenshaw/LAX). This large package of stories looks at many facets of the sprawling region. South L.A. is no longer a place apart. Today, it sits in the center of the California story, embodying some of our greatest possibilities and our greatest struggles. And in a particularly nasty and anxious time in the United States, when pessimism and angry nonsense spread faster than Western wildfires, the South L.A. of 2016 offers a tough-minded but optimistic narrative that ought to remind us just how much can be achieved—beyond mere survival—through gritty determination and small, steady improvements. South L.A. is both the closest thing we have to an urban success story, and the furthest thing from a fairy tale. In today’s South L.A., crime, despite recent upticks, is less than one-third of what it was a quarter century ago, access to health care is improving, there are more and better schools, housing prices and home ownership are up, transportation and arts and food options are multiplying. And major new developments are arriving—with all their promise and peril. Of course, it is dangerous to generalize about a place so large and diverse. South L.A. consists of about 30 very different neighborhoods, from pristine suburban-style historic tract to industrial precincts to college-town enclave to narrow boulevard-based corridors. South Los Angeles is comparable in size to San Francisco, California’s fourth largest city. Both are nearly 50 square miles and have populations of 850,000. As a disclaimer, I shot some of the photos for the series. It was a great chance to travel around to the many neighborhoods and see many of the areas on foot. I certainly hope the growing Metro Rail network makes it easier for residents and visitors alike to get in and out of the different neighborhoods. 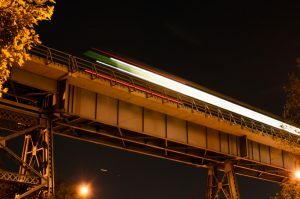 The money will go to improve the welds and strength of the so-called “cow-catchers” at the front of trains that prevent debris from getting under a train’s wheels if a collision occurs. Since the problem was identified — as a result of a collision with a vehicle in Oxnard in early 2015 — Metrolink has been leasing freight locomotives to run in front of trains as an additional safety measure. Regarding the cuts to evening rail service, it seems that Metro is suffering from a PR dilemma of their own making. I’m looking at old Expo schedules from 2012 and 2013 and see that service improved from 20 minutes after 7 PM to 10 minutes until midnight. If they hadn’t increased evening rail service back in 2013, they wouldn’t be taking the PR hit for the service reduction right now. This situation is reminiscent of the PR hit that Gray Davis took when he cut the vehicle license tax during his first term, and then rescinded that cut when the economy turned sour. Instead of a “Thank You” for a few years of reduced taxes, he paid the ultimate price by being recalled and we were stuck with two terms with the Governator. Hopefully the new ballot measure won’t suffer a similar fate. I lived in the Bay Area for several years and worked in San Mateo county. I think it would be fair to describe Caltrain as “broken by design”. It was put in place decades ago when suburbanites feared public transit for the potential to bring “undesirable people” into their community. It worked to bring financial workers from their bedroom communities directly into downtown SF. But it does not work for the reverse-commute due to poor connectivity with local transit. When SF Muni tried to connect light rail to Caltrain at the southern end of the city just a decade ago, Caltrain responded by moving their stop a hundred yards south across the county border without informing SF of the plan. For many SF residents, getting to Caltrain means connecting across three different agencies– Muni, to BART, to Caltrain. This is expensive and roughly triples travel time. The local shuttles were elitist, but they were a response to a political problem. I’ll call hogwash on the “maintenance” excuse for cutting service. Metro CEO cut service to save $4.4 million this coming fiscal year, simple as that. How you gonna open a brand new rail line then claim the best Metro can do is 20 minute headways?! I don’t want our system to deteriorate like Bart or DC Metro but I know that y’all just cutting service and not doing maintenance. Do some single tracking then I might believe you. MTA is still affected by the anti public transit mentality brought to it with merger of the pro transit RTD and the anti public transit from the LACTC. On more than one occasion prior to the merger the LACTC threatened to withhold transit dollars due the RTD if the RTD did not cut service although ridership was increasing. The same is true today. Serviceable buses sit in various MTA storage yards long before their projected retirement. The MTA headquarters is over staffed, something Art Leheay tried to address, with employees in some cases making critical decisions concerning service that in actuality are based on faulty assumptions, not on hard data and experience. Past Directors of Transportation have included a Child Psychologist; a person who had no idea what type of service was being provided who went on to Washington DC only to be terminated six months later. Art had the experience to run the MTA. He had started his transit career as a Bus Operator with the RTD and progressed thru the ranks along with his wife to key positions within the agency. They were both terminated shortly after the merger took place. Many believe the reason was they were to knowledgeable and stood in the way of diverting funds away from public transit in favor of non transit alternatives. Art left his job at OCTD to become the CEO of the MTA. One of his first tasks was to cut unneeded waste within the agency offering those employees being terminated positions as Bus Operators. At that time the MTA under his leadership was engaged in hiring record numbers of new Bus Operators. I truly don’t understand why Metro is cutting rail service right before putting Measure R2 on the ballot. The maintenance excuse is lame and everyone knows it. Plenty of transportation agencies manage to provide better headways while properly maintaining their systems. This is just a cost-cutting measure, and frankly, it’s pretty disappointing. The last measure failed by 0.6%. The decision to make service worse right before this vote could make that 0.6% difference this time around.. I really want to love Metro, but they make it really hard to do so.